The Bank of Ghana has announced that it has taken over the management of some banks in the country because they have failed tom meet the minimum capital requirement. The affected banks are Royal Bank, Beige Bank, Sovereign Bank, The construction Bank and Unibank. The banks have been put under new name Consolidate Banks. Government has committed 450 million cedis to support this banks. Announcing the move, the governor of the Central Bank Ernest Addison noted: “Beige, Sovereign and Construction Banks obtained their licenses under false pretenses using fictitious and nonexistent capital”. The development comes as the Construction Bank voluntarily folded up its Ghana operations on Tuesday July 31,2018. The Bank of Ghana today has granted a universal banking licence to Consolidated Bank Ghana Limited established by the Government. The Bank of Ghana has also today revoked the licences of uniBank Ghana Limited, The Royal Bank Limited, Beige Bank Limited, Sovereign Bank Limited, and Construction Bank Limited and has appointed Mr. Nii Amanor Dodoo of KPMG as the Receiver for the five banks. All deposits of the five banks are safe and have been transferred to the Consolidated Bank. Customers can carry out their business as usual at their respective banks which will now become branches of the Consolidated Bank. All staff of these banks will become staff of the Consolidated Bank. Boards of Directors and shareholders of these banks no longer have any roles. The Bank of Ghana is mandated by law to promote the safety, soundness, and stability of the financial system and to protect the interests of depositors. In this context, the Bank has over the last year rolled out measures to strengthen the financial system to protect the interests of depositors however, a number of legacy problems have plagued the banking sector including macroeconomic factors, poor corporate governance and risk management practices, related party transactions that were not above board, regulatory non-compliance, and poor supervision, (questionable licensing processes and weak enforcement) leading to a significant build-up of vulnerabilities in the sector. From an Asset Quality Review (AQR) of banks conducted by the Bank of Ghana in 2015 and updated in 2016, a few indigenous banks were identified as vulnerable with inadequate capital, high levels of non-performing loans, and weak corporate governance. In August 2017, the Bank of Ghana closed two of those banks (UT Bank and Capital Bank) and approved the acquisition by GCB Bank of some of their assets and liabilities under a Purchase and Assumption Agreement. Other banks that were more recently licensed in 2016 and commenced operations in 2017 also began to show signs of distress, primarily due to conditions under which they obtained their licences. uniBank and Royal Bank were identified during the AQR update in 2016 exercise to be significantly undercapitalized. The two banks subsequently submitted capital restoration plans to the Bank of Ghana. These plans however, yielded no success in returning the banks to solvency and compliance with prudential requirements. The Official Administrator appointed for uniBank in March 2018 has found that the bank is beyond rehabilitation. 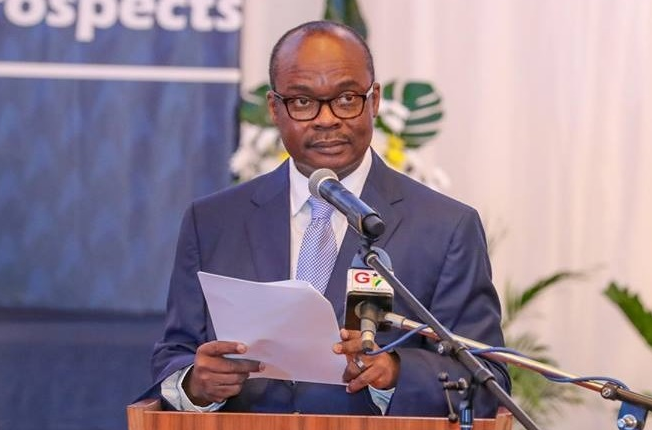 Shareholders, related and connected parties had taken amounts totaling GH¢3.7 billion which were neither granted through the normal credit delivery process nor reported as part of the bank’s loan portfolio. In addition, amounts totaling GH¢1.6 billion had been granted to shareholders, related and connected parties in the form of loans and advances without due process and in breach of relevant provisions of Act 930. Altogether, shareholders, related and connected parties of uniBank had taken out an amount of GH¢5.3 billion from the bank, constituting 75 percent of total assets of the bank. In the case of Royal Bank, an on-site examination conducted by the Bank of Ghana in 31st March, 2018 revealed a number of irregularities. Its non-performing loans constitute 78.9 percent of total loans granted, owing to poor credit risk and liquidity risk management controls. A number of the bank’s transactions totaling GH¢161.92 million were entered into with shareholders, related and connected parties, structured to circumvent single obligor limits, conceal related party exposure limits, and overstate the capital position of the bank for the purpose of complying with the capital adequacy requirement. In the case of Sovereign Bank Limited, as part of Bank of Ghana’s investigations into the failure of Capital Bank Limited (currently in receivership), it emerged that Sovereign Bank’s licence was obtained by false pretences through the use of suspicious and nonexistent capital. The bank is insolvent and unable to meet daily liquidity obligations falling due. Liquidity support granted so far to the bank amounts to GH¢21 million as of 31st July 2018. The bank has not been able to publish its audited accounts for December 2017, in violation of section 90 (2) of Act 930. Beige Bank and Construction Bank were each granted provisional licences in 2016 and launched in 2017. Subsequent investigations conducted by the Bank of Ghana, revealed that similar to the case of Sovereign Bank, both banks obtained their banking licences under false pretences through the use of suspicious and non-existent capital, which has resulted in a situation where their reported capital is inaccessible to them for their operations. To help ensure that the banking sector maintains a strong indigenous presence, the government has established a new bank called Consolidated Bank Ghana Limited which will act as a bridge bank pursuant to section 127 (11) of Act 930, to assume some of the assets and liabilities of the five banks. The Government has capitalised the new bank in the amount of GH¢450 million and the Bank of Ghana has issued it with a universal banking licence with effect from 1st August 2018. The Bank of Ghana has also approved a Purchase and Assumption Agreement between Consolidated Bank and the Receiver for the five banks. Under the Agreement, Consolidated Bank has acquired all deposits and other specified liabilities, and good assets of the five banks. To finance the gap between the liabilities and good assets assumed by Consolidated Bank, the Government has issued a bond of up to GH¢ 5.76 billion. The Government has assured the Bank of Ghana that it will be providing financial support to other indigenous banks as needed, to help them meet the minimum capital requirement of GH¢400 million by 31st December 2018. The Government has indicated that such support will be limited to indigenous banks that are solvent, well governed and managed, in full compliance with the Bank of Ghana’s regulatory requirements, and able to demonstrate that they have been unable to access private sector solutions for recapitalization due to market conditions. Additionally, the Government has committed to further explore policy interventions needed to make the entire financial system more robust, for the benefit of the Ghanaian economy. The Bank of Ghana remains committed to supporting the orderly development of Ghana’s banking sector, including indigenous Ghanaian banks, while promoting a strong and resilient sector to drive Ghana’s economic growth. In keeping with this commitment, the Bank of Ghana will take additional steps to ensure that all relevant parties whose actions contributed to the failure of the five banks are held accountable through administrative, civil, and criminal actions as appropriate.